Plan trips.... Upgrades.... Look at pics online (500 hits in one day on the Z3 Fixit Day site)... read all the stuff you never had time for before.... read the message boards and email lists....and talk to other z3ers... because they are the *only* people who understand. So I was having a chat with a fellow Z3er, TomY and naturally the conversations turned to... Z3s of course.... and garaging. 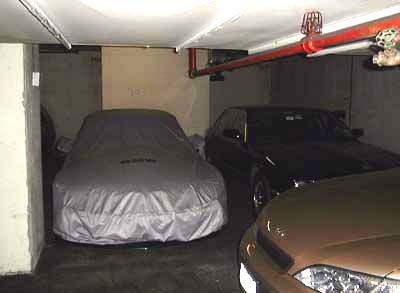 I went over to his place to check out his garaging situation (okey... now that is desperate, right?) 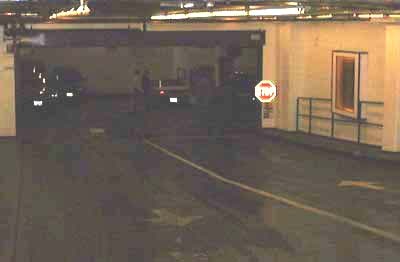 and we spent a some time discussing city garaging vs. suburb garaging. OK... so sometimes we city folk become jealous of the suburb folks, with their tiled garages (yes I know someone who tiled their garage so they could wash their car inside in the winter- Laurie...). Then I had a chat with someone who has a suburban garage and pointed out the pitfalls of that scenario. Then I was in my garage and trying out how to improve the situation there. City-Attendant parking :-( Car is hidden away, which I think is good. 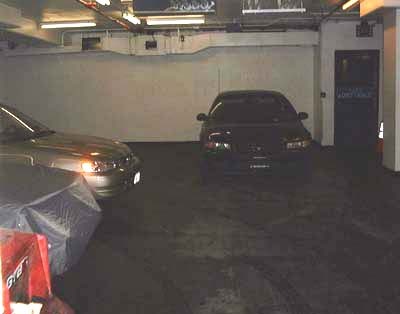 Cars that are parked in the primo spaces are more likely to attract gawkers or passersby who would do damage. Con is that you have to wait for your car because its "parked in" by other cars. Attendant parking means shoe marks on the door sill, among other things. Suburbs. Home Garage. I know of three, 2 I have seen. 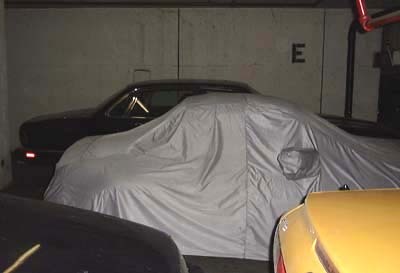 The third said he bubble wrapped his car at one point to protect it from the kids coming and going. One I visited also had the kids around, hard to see a child on a bike even behind my little Z3. 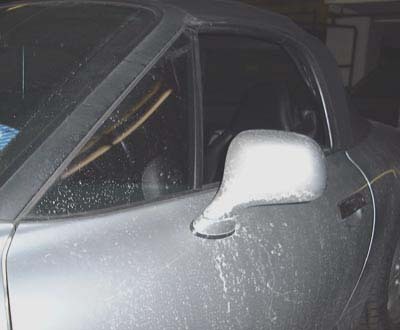 As soon as the car was put safely away, the housing of the garage door opener light fell on the hood of his Z. Small mark. There are often items in the garage that can come loose and fall on the Z (rakes, shovels....). One distinct advantage to suburban parking is that you don't come to your car and find any surprises. Laurie in Ohio often sits in her car in the garage listening to music. 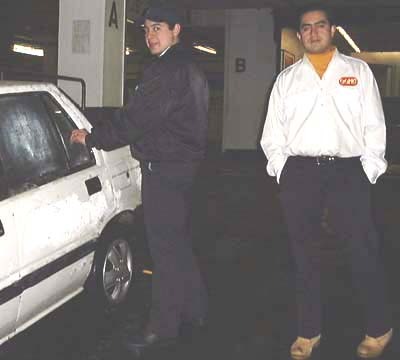 I am not allowed to vacuum/wash/wax my car in the city garage. JohnB bought a garage with a house attached to it. make a page of Garages ... natch! As I walked down to the garage, the attendants saw me and before I even got a chance to explain, they said, "You're NOT taking your baby out today!!" I explained what I was doing, and they explained they were chipping the ice off their car, just because they were bored. 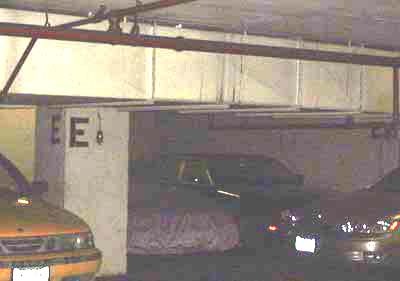 Here is what I was talking about, parking upstairs. This is a little old MG I think. See how it's parked by a trash can and an access to my building? Sure, it gets special treatment, and probably no one but the owner drives it, but with so many people walking by, I am pretty sure someone has been poking around it. Imagine its a busy time, evenings around here with several theaters, a couple bars, and a rock club (Irving Plaza). I have seen some large groups of nasty drunk people getting angry about not getting their car fast enough, or how much they have to pay. I'd rather be away from everyone, but it's a gamble. Then I went around the garage a little to check things out. Gee, I wonder what's under there. You think I looked under the cover? NO! But you see what I mean. 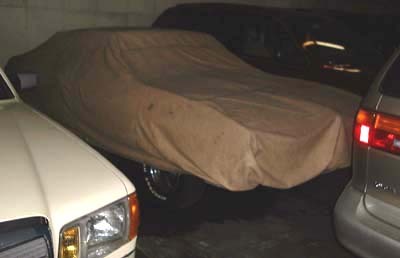 If your car is under a cover and looks interesting and there are loads of people walking by.... someone is going to lift that cover. 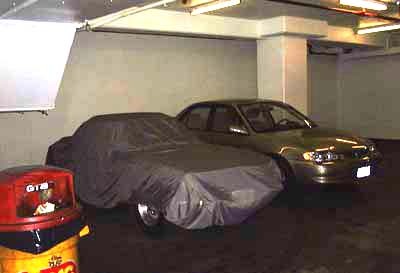 Note, this car is safely tucked away downstairs. Oh and its completely surrounded by an army of Sport Futility vehicles, not a one of them with so much as a spot of dirt on them. 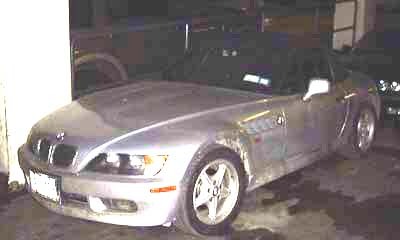 Yeah right buddy, you drive an SFV into Manhattan because you need a reliable car that is safe in bad weather. B.S!!!! They just drive them to intimidate everyone. 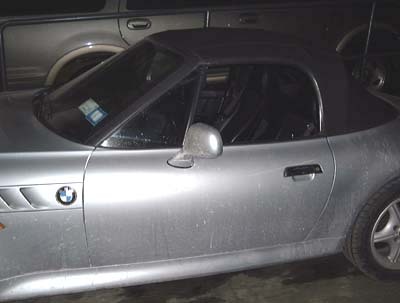 Here is a Z3 I see around here all the time. I left a note on it, but never heard from them. 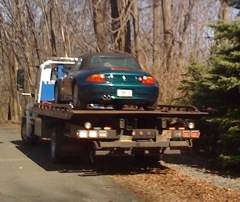 As much as it pains me to see a Z3 left like this, I admire them for DRIVING the car and obviously enjoying it. It also goes to show you that these cars can take quite a but of punishment and still look good. I have seen this car in a lot of circumstances and it always comes back looking good. Also note even more SFV's. The garage and the city is full of them. She looks pretty good today, no one is anywhere near her. She is lucky to be on the passenger side of the car on her side, and have a post on the other. Since its attendant only parking, there is hardly any chance of anyone opening a door on her. One day when my other car gets out of the shop, it will take the place of the Jag.